You are currently browsing the Carpe DMM blog archives for November, 2012. We are relaxing some more in our room after an easy day wandering around central Santiago. We got up late, a bit after 09:00, and went to the breakfast buffet. We had cereal, bread rolls, and M. had a freshly cooked fried egg to order and a pancake with jam. 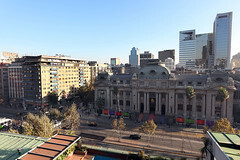 A bit later, we went for a walk, heading north into central Santiago and the Plaza des Armas. On the way to the plaza, we saw a CD shop where I stopped to see if they had any CDs of the Latin American covers of U2 songs that I’d been hearing everywhere in Peru. The old lady in the shop spoke no English but I managed to get her to pull out half a dozen real U2 albums. But when I tried to indicate that I was looking for their songs by other groups—Latin American groups—she was boggled. She called a guy who came from somewhere a minute later and who spoke a bit of English. I think I got my request across, but when he explained it to the lady, they both looked at me seriously and said no such thing existed, at least not in Chile, as if they were denying any association with scandalous bootleg cover versions. Disappointed, we left to continue onto the Plaza des Armas. 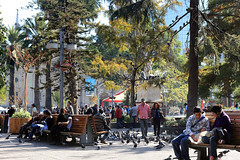 This square was smaller than I expected, smaller than the one in Lima, and more cluttered with objects: trees, benches, statues, etc, that blocked sightlines across the square. There was also a line of marquees set up along one side and a bit around the corner in front of the cathedral. It appeared to be a book publisher exposition or something, as all the stalls were full of new books. We went in the Metropolitan Cathedral to look around. A sign outside seemed to say restoration work was planned and sadly it looked like it on the inside. 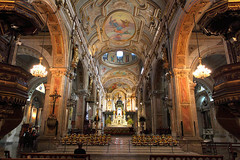 It could have been beautiful, but the paintings on the ceiling vaults and walls looked dusty and dull, and some small parts of the ceiling were patchy and broken. We walked around inside, including going down into the crypt, where there was a large space with a crucifix sculpture protected by bars. One of the chapels around the sides of the cathedral contained an altar dripping with silver. Part of the right side of the main aisle was cordoned off and there was scaffolding there, so maybe they’d started working on it already. 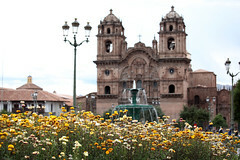 It’s a travel day, as we go from Cusco to Santiago, via Lima. We rose at 06:15, after a reasonable night’s sleep. I took another Imodium just before bed to ensure I didn’t repeat any of the problems of the previous night. Thankfully it seemed to work. We had breakfast about 06:30, then returned to our room to brush teeth, seal up our bags, and head out. I had to use the loo urgently, but it was a fairly normal event. It did however hold us up a few minutes while our taxi was waiting outside the hotel. We checked out and were on our way by 07:10. At Cusco airport, we had to check in, for which there was only a single counter open, with a queue of a dozen or so people. Nearby were self-check-in terminals, but no matter what I tried, frequent flyer number, booking confirmation code, passport number, nothing worked to access our booking. So we waited in the queue as it slowly trickled forwards. The two men in front of us got to the counter and took ages there. M. said they were changing their flights. Finally, they left and we checked in. We tried to go through security, but they wouldn’t let us until closer to our flight time. So M. got a cappuccino at a cafe while we waited. Then we went through and were on our way on another flight. The flight to Lima was an eventless one and a half hours. The good thing was arriving and feeling the sea level air pressure and the soothing effect it had on our breathing and heart rates. At Lima, we emerged from the domestic arrivals area into the main terminal, and then went upstairs to the departures area to go to international departures. The first thing was a security check, which was pretty quick, then we had to clear immigration, which took significantly longer. There was a single queuing corral, but at the end it split up into four lines, supermarket checkout style. We chose the wrong line, because someone in front of us apparently had a problem and our line didn’t move at all for about ten minutes. Meanwhile, people who had been fifty people behind us in the original queue were passing through before us in one of the other sub-queues. Eventually we made it through, then browsed some shops on the far side. I tried asking in one shop that had CDs for Latin American covers of European pop songs. A guy told me he knew exactly what I meant, such things were very well known, but they didn’t have any! We rose late and had breakfast and dropped off a load of laundry at the nearest lavanderia, before the final tour group meeting. Ale was there in the hotel lounge early, writing out cards with our tour number for us to fill out online feedback when we got home. Kim and Laura were there, and Pan and Jian, and Zaina and Zeeshan, and Olivia, and us. Andrew was apparently still sleeping after a late night out, and I don’t know where Lynne and Garry were, though we had seen Garry earlier while eating breakfast. Ale collected our e-mail addresses in her diary, while I handed out my photo cards so the others could check out my photos from the trip. Then farewells were said and we handed over an envelope with collected tips – we were a little generous with ours as we thought Ale had done a great job and we’d enjoyed everything on the tour. Hugs were shared and officially we were no longer a tour group any more. For reasons of busy-ness and the fact that I’ve been learning lots of new drumming stuff at my weekly lessons that I’ve been practising, I haven’t done a play-along of the first song on our band’s initial set list (Brass in Pocket, by the Pretenders) since our first group practice session several weeks ago. I was starting to worry that I might have forgotten how to play it, so I just decided to give it a play through now. And played it through, two times out of two, at least as well as I’ve ever played it before. Possibly even better – more fluid, better timing. It looks like all this practice I’m doing is actually making me better! I detect that in the future, some English words will grow to infinite length. We began with the verb “to burgle”, meaning to steal something from someone. A person who burgled was then called a burglar. Apparently now, according to many American sources, burglars don’t burgle any more. They “burglarise”. Or “burglarize”, I guess. The next logical step must be that people who burglarise will become known as burglarisers. Or maybe burglarisors. Then, given past experience, it will no longer be satisfactory to refer to the activities of burglarisors as “burglarising”, but rather it will become known as burglarisorising. And then people who burglarisorise will become known as burglarisorisers. If you think “burglarise/burglarize” is a perfectly good word, just think of applying the exact same process to some other verb, like “run”. Someone who runs is a runner. According to this American English progression, what a runner does should no longer be described as running, but runnerising. At 04:15 my watch alarm went off. We like to double the wake-up alarms to be sure. We packed our bags and went down for breakfast just after 04:30, still with no wake-up phone call. The breakfast was still being prepared, so we sat for a few minutes until the guy motioned us to eat. There were sweetish breads, ham, cheese, butter, jam, and the guy came to take egg orders in Spanish. There was no cereal. We ordered fried eggs each and received one each, sunny-side down. M. had saved half her bread roll to have it on, but I’d eaten mine already. Some others drifted down to eat, and we quickly learned that nobody had got their wake-up calls. We told Ale, and she raced upstairs to check on everyone, then had some heated Spanish with the reception lady, who appeared in her pyjamas. However, we still managed to assemble everyone by just a couple of minutes after 05:00. Jian was the last to join us, as he was in his room watching the royal wedding (Prince William and Kate Middleton) live on TV from England! 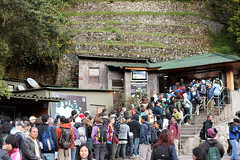 We left to walk down the hill to the bus stop for the buses to Machu Picchu. We joined a queue in the pre-dawn darkness, which already contained several hundred people ahead of us. Buses were lined up along the street and more kept arriving and turning around to join the back of the queue of buses. The street was barely wide enough for them to do a three-point turn without falling into the adjacent river, and the footpath barely existed, so the buses blinked their lights to get queuing people out of the way as they turned. As we waited, the street light nearest us blew. All the others up and down the street were still on. This let us see the stars, with Scorpius setting over the mountain to the west that hid Machu Picchu far above. The thin crescent moon rose slowly over another mountain to the east, horns pointing upwards as it preceded the sun. 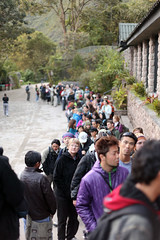 Vendors with baskets of water, snacks, and even promising hot coffee scouted up and down the queue looking for customers. We saw some of the royal wedding on TVs in cafes by the street. The first bus left at 05:30 and people filed on to them one at a time, each bus leaving as it filled up. More buses kept coming and even though we were 400 or 500 people back in the queue, there was no danger of the buses running out before we got on one. Eventually we’d worked our way down and climbed aboard a bus, Ale showing the ticket inspector tickets for all of us. It’s been a long time since I last typed up a day of this travel diary. But I haven’t forgotten it! We are resting in our room after breakfast. We got up at 07:00, but M. was tired and after a shower climbed back into bed, while I wrote up some of yesterday’s diary. A short time later, the power went out, so I laid down and closed my eyes too. 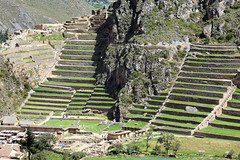 We intended to go to breakfast at 08:00, to have time to meet the group at 08:30 for an optional walking tour of Ollantaytambo. But when the lights came back on and we looked at the time it was 08:17 already. We dressed and went to the breakfast room, where some of the group were already waiting with Ale, while some others were finishing breakfast. I told Ale we wouldn’t be coming for the walk as we were running a bit late. Breakfast was some sticky cereal like the one at Cusco, strawberry yoghurt, flat bread rolls, and eggs cooked for us. That done, we came back to our room again for a bit more rest before checking out the Inca remains here in town. 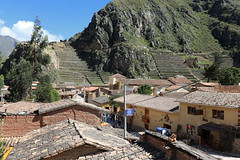 We have arrived in the town of Aguas Calientes after our PeruRail train trip from Ollantaytambo down the Urabamba River. 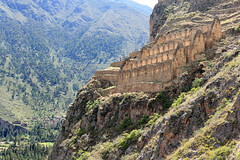 Back in Ollantaytambo, we went out to get M. a cup of coffee. We went back to a place we’d tried after dinner last night, Hearts Cafe, although then they had turned off the coffee machine for the night. M. got a cappuccino, and for the first time on the trip it had chocolate on top instead of cinnamon. On the way we ran into Ale in the square and she asked if we’d climbed the mountain to the Inca remains looming over the town on the mountainside, or visited the Inca religious centre at the other end of town. We hadn’t done either, but were planning to visit them later. However Ale suggested climbing the mountain, saying Andrew and Zaina and Zeeshan were doing it, and the views from the buildings above were spectacular. So first we went back to the hotel to get my camera bag, and ditch my jacket because I hadn’t realised how hot it was. We walked to the square and down a narrow laneway between buildings to the starting point of the climb. The way was steep and rocky, and M. didn’t like the look of it, so she waited at the bottom while I climbed up. I had to pause to catch my breath several times. Not far up I noticed Andean pipe music drifting down the mountain. It turned out to be a guy playing in a shady spot next to the path. He asked, in Spanish, if I had water, then switched to good English when I said I didn’t speak Spanish. I gave him a sip from my water bottle. He said he liked to play there because of the acoustics of the music bouncing off the mountainside. He gave me an encouraging farewell as I continued up past him.